Download a blank fillable Dd Form 2798 - Application/permit For Use Of Space On The Pentagon Reservation in PDF format just by clicking the "DOWNLOAD PDF" button. Complete Dd Form 2798 - Application/permit For Use Of Space On The Pentagon Reservation with your personal data - all interactive fields are highlighted in places where you should type, access drop-down lists or select multiple-choice options. issuance of a permit and could result in a denial of the permit requested. See Conditions on back. 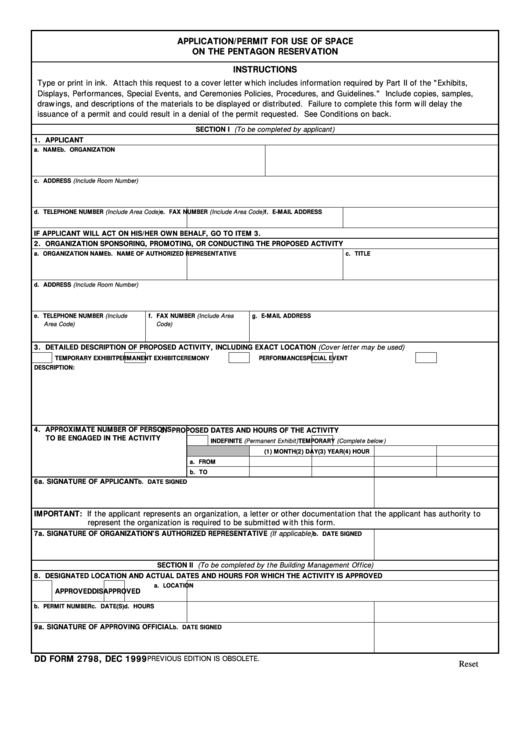 IF APPLICANT WILL ACT ON HIS/HER OWN BEHALF, GO TO ITEM 3.
represent the organization is required to be submitted with this form.